Thousands of horror and theme park fans packed into the Charles M. Schulz Theater at Knott’s Berry Farm Wednesday night for the annual Knott’s Scary Farm Announcement Event. Supervisor of Park Shows Jeff Tucker was on hand to serve as emcee for the event, and he brought a great sense of humor along with an assortment of terrifying ghouls and creatures of all shapes and sizes. Tucker began the presentation by being wheeled out in a “Silence of the Lambs”-inspired Hannibal Lecter getup, then extolled the virtues of becoming a Knott’s Scary Farm Pass holder. The Scary Farm Pass includes access to every night of the Haunt, and now has the option to add parking. The first attractions previewed during the event were the shows. There are two live shows at this year’s Scary Farm: “Elvira’s Asylum” (featuring everyone’s favorite Mistress of the Dark) and “The Hanging: Straight Outta Calico”, the very long-running pop-culture hatefest that runs in the park’s Calico Square several times a night during the haunt. Up next were the Scare Zones, of which there are three: “Fiesta de Los Muertos” (inspired by the Mexican Day of the Dead), “CarnEvil” (featuring dozens of creepy clowns), and the classic “Ghost Town”, which will now include the popular Dollmaker character from the retired Doll Factory maze. After that, Tucker listed the haunted mazes that would be returning for this year’s Scary Farm: “Pinocchio Unstrung” (starring a demented version of the age-old storybook character), “Black Magic” (centered around famous early-twentieth-century illusionists), “Trick or Treat” (which of course takes place at Halloween), “Forevermore” (themed around Edgar Allan Poe stories and poems), “Voodoo” (which takes you through an eerie New Orleans swamp), “Tooth Fairy” (a twisted take on the childhood fable), and finally “Gunslinger’s Grave” (the Western maze that this year will include a new werewolf theme, “Blood Moon Rising”). Also returning is the interactive laser-tag-type maze “Special Ops: Infected”, which will feature more advanced guns, a health and recharge system, and a new “Patient Zero” theme. First listed among the new mazes was “Dead of Winter”, which had already been announced at the ScareLA convention in Downtown Los Angeles earlier this summer. “Dead of Winter”, of course, reflects an unmistakable influence by a highly-visible pop-culture phenomenon of the past few years that Disney fans will likely recognize (here’s a hint: the main menace of this maze will be an evil Snow Queen). The legendary Calico Mine Ride will be rebranded as “My Bloody Valentine”, which tells the story of a little girl in the Old West looking for her murdered father in an abandoned mine, and both of their ghosts that haunt the area for hundreds of years afterward. Also new this year is the interactive maze “Paranormal Inc.”, based around a fictitious ghost-hunting reality TV show. The overeager stars of this show were brought on stage to introduce the maze, and one of them was spookily swept away before the presentation ended. The finale of the Knott’s Scary Farm presentation featured the ever-cackling Green Witch, who introduced “The Deadly Seven”, a collection of creepy creatures that will haunt the entire park instead of being restrained to one particular maze or Scare Zone. 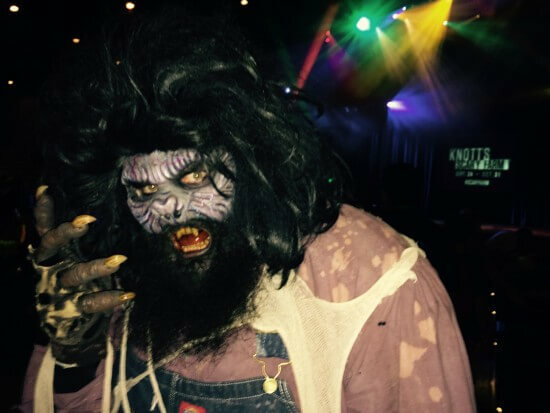 Scary Farm fans certainly have a lot to look forward to this year when they attend the haunt, which has been running at Knott’s Berry Farm since 1973. 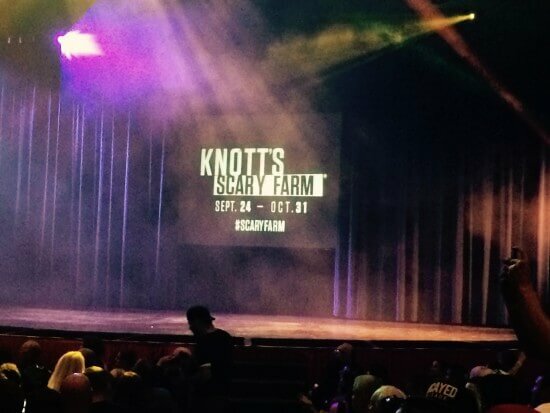 Knott’s Scary Farm runs this year from September 24th through October 31st.